Launching a boat usually goes one of two ways; either everything lines up perfectly and it’s smooth sailing from there, or you end up in the latest “boat ramp meltdown” video being shared by all your friends on social media. We’ve all had to learn the ropes of backing a boat down a narrow ramp into the water, and we’ve also witnessed what it looks like when a rookie steps up to the plate to take a crack at backing a boat down the ramp. It’s a skill that takes plenty of repetitions to really master, so if you’ve never launched a boat at a crowded boat launch, well… let’s just say things can spiral in a hurry. 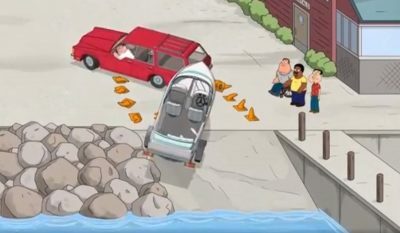 The writers from ‘Family Guy’ recently trolled those anglers who always have trouble launching their boats, and it might feel a lot like déjà vu for some. . .
We all have that fishing buddy who doesn’t have any patience at all, so be sure you have your camera ready next time they’re trying to launch a boat. It can make for some Grade-A video content that may even end up here on OutdoorHub! The post Video: Peter Griffin Easily Had The Funniest Boat Ramp Meltdown of 2018 appeared first on OutdoorHub.